Lanemark brickworks appear to have been renamed Afton Brickworks at a later date as both appear to have been present on the same site. However these early Works named Afton may be at a different location from the later Afton Works. Requires clarification. 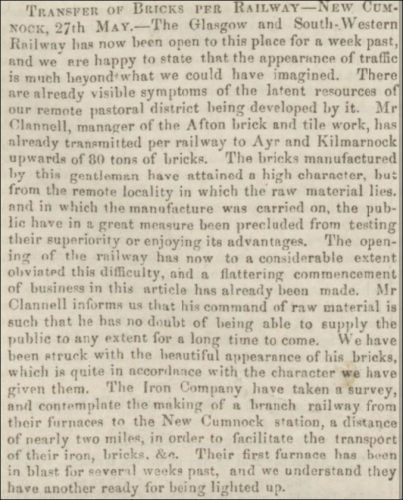 Below – 29/05/1850 – Dumfries and Galloway Standard and Advertiser – Article regarding Mr Clannell’s Afton Brickworks. The quality of the bricks and also that they are now transported by railway. Below – 30/07/1851 – Dumfries & Galloway Standard – Advert Dickenson & Co, Afton, New Cumnock. 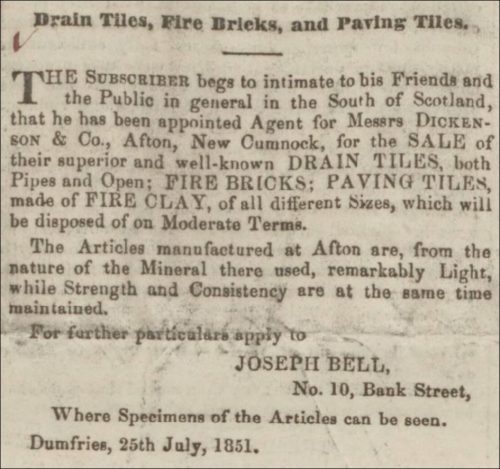 The subscriber has been appointed Agent to Messrs Dickenson & Co., Afton, New Cumnock, for the sale of their Superior drain pipe tiles, fire bricks and fire clay, which may be obtained on moderate terms, at any Station along the Line of the Glasgow and South-Western Railway, on application to J.BELL, 10, Bank Street, Dumfries. 15th November, 1851. 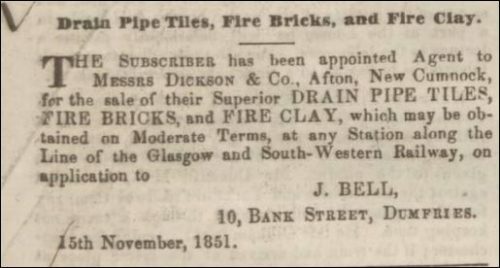 Below – 17/12/1851 – Drain pipe tiles, fire bricks and fire clay. 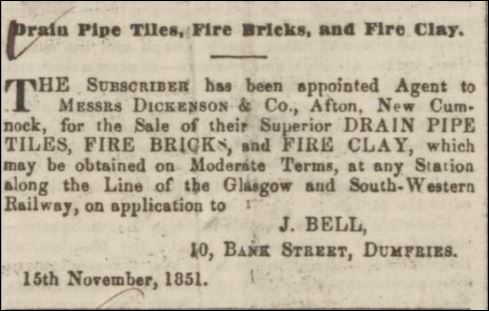 The subscriber has been appointed Agent to Messrs Dickson & Co., Afton, New Cumnock, for the sale of their Superior drain pipe tiles, fire bricks and fire clay, which may be obtained on Moderate Terms, at any Station along the Line of the Glasgow and South-Western Railway, on application to J.BELL, 10, Bank Street, Dumfries. 15th November, 1851. 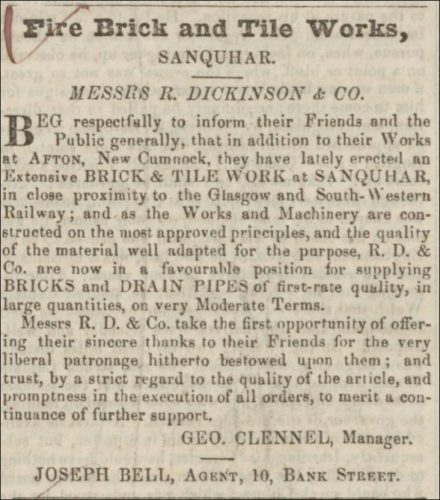 Below – 27/10/1852 – Dumfries and Galloway Standard – Messrs Dickinson announce that in addition to their Afton Brickworks, New Cumnock they are now opening an extensive brick and tile works at Sanquhar. 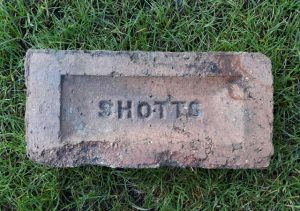 09/04/1930 – Dundee Evening Telegraph – New Dundee primary school opens …..externally the property is faced with Afton multi coloured bricks…..the surrounding wall of the playground on the southern side of the school and the railing walls are built of Shotts grey brick. 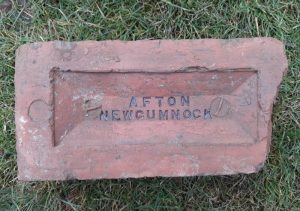 19/10/1931 – The Scotsman – Pit baths at New Cumnock ………The building is of brick supplied by the Afton Terra Cotta Company and presents a fine appearance. 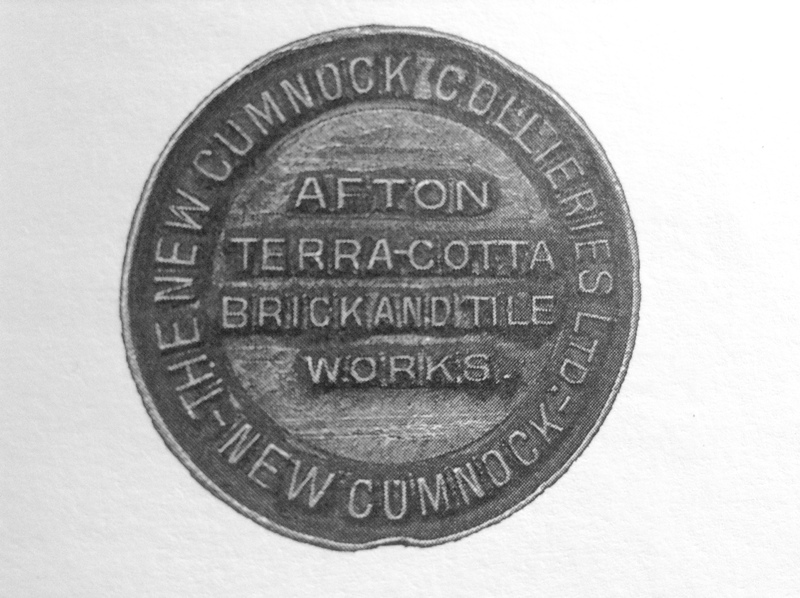 17/06/1936 – Dundee Courier – Scottish inventions – W. Greenhough, C/O the Afton Terracotta Brick and Tile Works, New Cumnock, Ayrshire and the New Cumnock Collieries, Ltd, Bank, New Cumnock – interlocking tiles for covering buried cables. 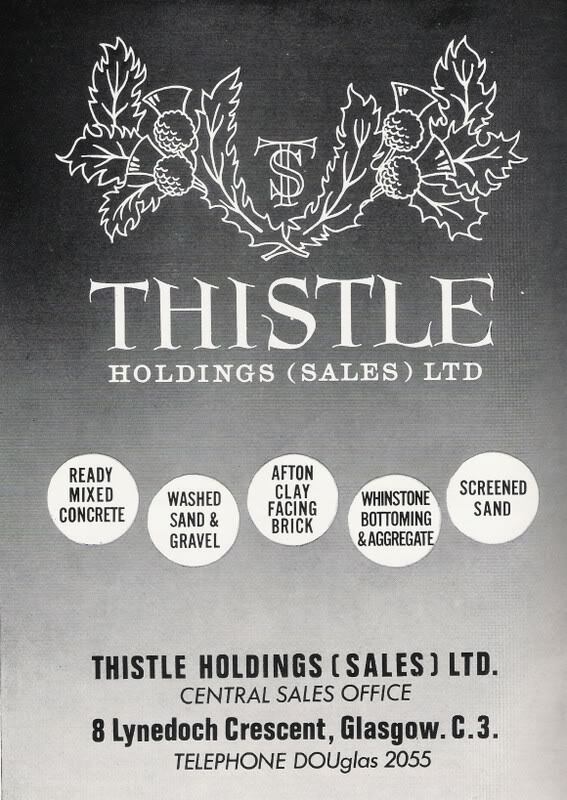 17/07/1936 – Montrose, Arbroath and Brechin Review – Proposed new housing Ferry Street and Hill Street, Montrose….it has been suggested to the Department that Buccleuch bricks be used instead of the Afton Terracotta facing brick suggested by the Department……..
Below – 1965 – Thistle Holdings ( Sales) Ltd, 8 Lynedoch Crescent, Glasgow – Afton clay facing brick. 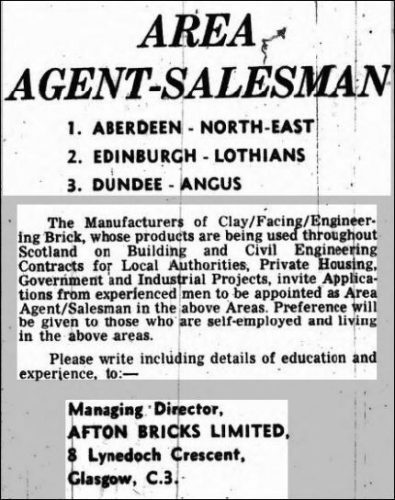 Below – Aberdeen Press and Journal – 04/01/1971 – Agent / Salesman wanted – apply Managing Director, Afton Bricks Limited, 8 Lynedoch Crescent, Glasgow. The following are snippets I recovered from notes kept by a brick enthusiast. July 1972 – Afton Bricks Limited, Larbert, Stirlingshire – Clay Worker Magazine July 1972 – Oil firing equipment wanted. I joined Afton in late spring 1972 and left shortly before it closed in summer 1976.I joined as assistant manager but after about 2 years the works manager left and I was made manager. It is a long time ago and I do not have any literature about the factory but I have tried to remember as much as I can. 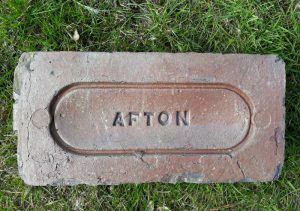 Afton was part of Thistle Holdings who also owned the Avonbridge brickworks near Stirling and 3 peat bogs in Fife who traded as Caledonian Peat Products. Thistle was owned by Northern Lime ltd who had offices in Penrith. Northern Lime in turn was owned by London and Northern Securities Ltd. Thistle holdings head office was in Glasgow when I started but it moved to offices in Denny during my stay. My Managing Director was Ken Whamond. We dug our own clay from a quarry about 2/3 miles from the factory and when I started we brought it in by road but subsequently we refurbished a bridge behind the factory so we could bring it in across country, about a mile. We used a Ruston -Bucyrus Digger but I cannot remember the size or type, when we refurbished the bridge we used a Shawnee Poole dump truck to deliver the clay. The clay was boulder clay which was very difficult to handle and use because of the large number of stones in it , they varied from small pebbles to the size if a small car. Because of the stone content we had a clay preparation department unlike any other I have worked with. The clay was tipped into a Thos Fawcett slat box feeder which fed the clay into a set of Bradley and Craver Kibbler Rolls, it was then fed onto a conveyor belt where an operative tried to pick off as much stone as he could before the clay was fed into a Bradley and Craven solid bottom pan mill, from this pan mill the clay was delivered into a Bradley and Craven wet Pan, I cannot remember the production rate or the number of bricks we made per day,40,000 a day rings a bell but I could not be certain. Even with relative low production rate after leaving the wet pan the clay feed was divided into two lines both of which passed the clay through 2 sets of high speed rolls, one pair were Bradley and Craven, the second pair was from Europe but I cannot remember the make. The clay from both these lines was reunited in a Bradley and Craven slatted base box feeder prior to going into the make area. The mixer and extruder were manufactured by Concordia, it was the only one of its type in the UK, there were 2 other Concordia’s in the country but they were of a smaller size, it was made predominately for soft extrusion and the very abrasive nature of our clay meant the auger knife tips had to be changed every week and new knife tips fitted. During my time there we had new patterns made to suit the Concordia`s circular shaft with the Bradley and Craven design one piece auger knives, we had them cast especially for ourselves in a material which was much more abrasive resistant than the original German ones, again I cannot remember the steel specification .After the extruder we had an old stippletex machine, a rusticator a Basin Sander, which were used to texture and sand the bricks depending on which product we were manufacturing. The column was cut into length by a Keller single arm cutter and the column then went into a side cutter where the individual bricks were cut. The marshalling and handling prior to going in to the dryer was by a George Willy pallet handling system, this both marshalled the pallets for the finger car prior to drying but also marshalled the bricks and removed them from the pallets after drying. The pallets of bricks were taken to and from the dryers by a finger car, originally a Keller car but this had been replaced by a Bradley and Craven car. The individual bricks were taken by a conveyor to an area where they were hand packed into packs to suit the part of the kiln they were to be set in .Fork truck set. The dryers were originally Keller type heated with finned hot water pipes running below the pallets of bricks, the water was heated by a Lancashire boiler. The dryer had been modified prior to my arrival .I cannot remember how many tracks there were but they had been modified by removing two of the walls to make 3 track into 2,the middle track then held a number if fans to circulate the hot air which was fed in from above. The heat was waste heat from the kiln. A second set of dryers had been built, I cannot remember the exact number but these were heated by a separate burner, again I cannot remember the fuel type. We had 2, 20 chamber Hoffman Kilns, one a traditional brick lined kiln with flues around the outside ,the other an unusual castible lined kiln with flues running in the centre of the kiln. The dampers were wound up from the top of the kiln. They were heated with 800secs medium fuel oil .I can`t remember the type of burner being used when I arrived but shortly after my arrival we purchased new burners, “STIEMER PERFECT“. Firing these kilns was fired in the normal way with chambers being papered off to connect them the flue draught. The bricks were fork truck set , the packs of dried bricks being shaped to suit the position in the kiln. When I arrived the bricks were packed inside the kiln chamber on trolleys, once the pack had been strapped the trolley was pushed outside the kiln to be picked up by fork lift truck to go to stock. This method of packing was subsequently changed ,pack building stillages were purchased and an outside packing area constructed. The fired bricks were then drawn from the kiln by fork truck and packed on the stillages ,strapped and then taken to stock. 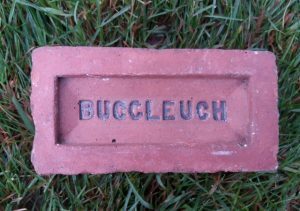 We could not manufacture a class B engineering brick as we could not meet the water absorption requirements although the crushing strength could be met so Afton Engineering bricks were sold as class7.We also produced a variety of sand faced bricks in a number of colours. 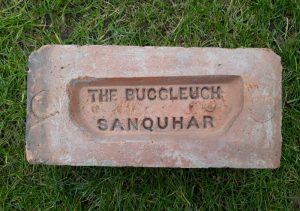 Stippletex and rustic bricks were also produced. Dealing with our difficult raw material and its abrasive nature meant that our production cost were high for our output and brick quality so making a profit was always difficult and it was obvious to me that the factory would have to close. I found another job with Ibstock Brick Leicester LTD and left. About 6/8 weeks after I left the factory closed. Found by Max Borland at Clydebank, Glasgow. Afton Brickworks, New Cumnock, Ayrshire. . . . .
Found by Eddie McLean in the Glasgow area. 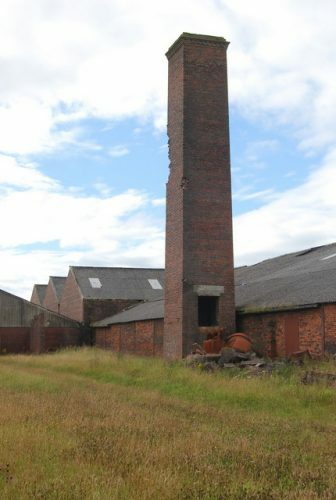 Northfield Brickworks, Shotts, Lanarkshire. . . . .